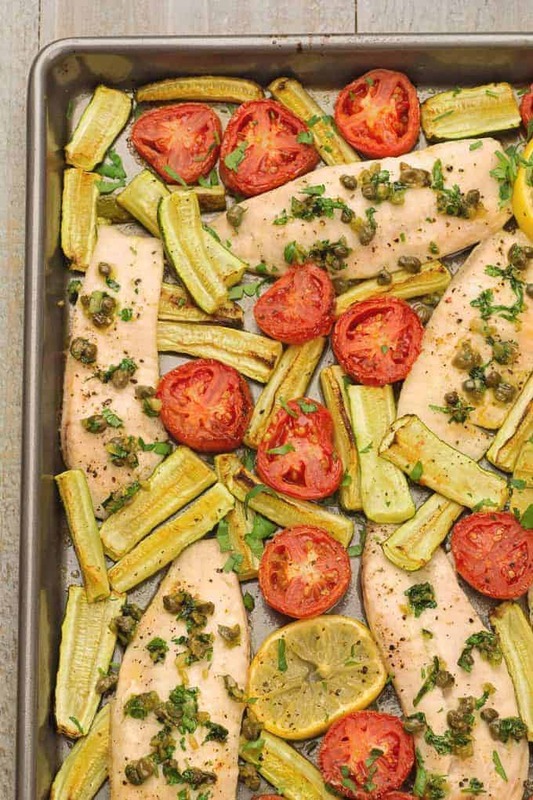 Fresh fish, zucchini and plum tomatoes make up a flavorful one-pan dinner that’s easy to make and a perfect choice for a healthy weeknight meal. While the main ingredients roast, we make an easy, Mediterranean-style topping to spoon over the fish fillets. It’s a slow-simmered combination of garlic and olive oil with capers, fresh parsley and lemon juice added just before serving. 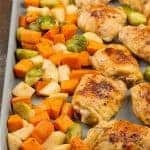 As with any sheet pan dinner, timing is key for this recipe. 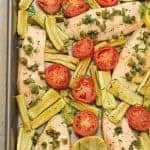 It’s important to start the zucchini and tomatoes ahead of the quick-cooking fish to let them caramelize so they develop their delicious, naturally sweet flavors. We like to keep this meal low-carb, so we generally serve it with just a salad, but a side of garlic bread would be a great addition. 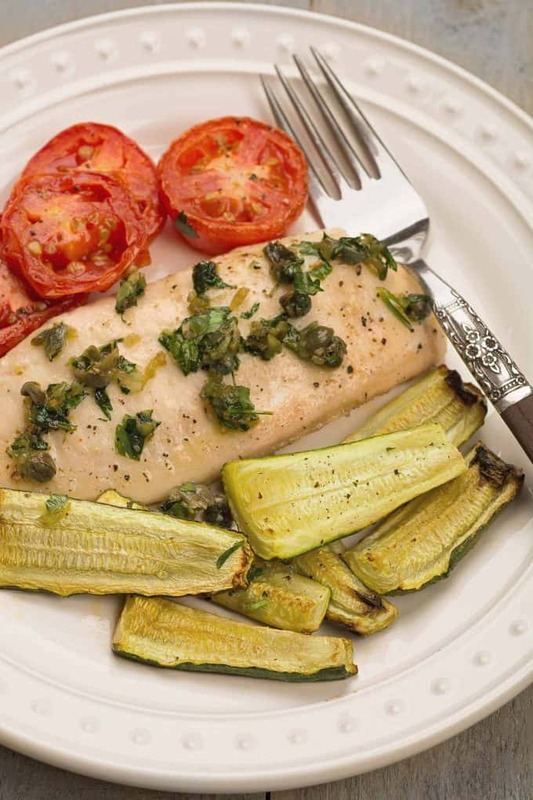 This is a simple, healthy weeknight dinner recipe for roasted fish, zucchini and tomatoes topped with a mix of slow-simmered garlic, capers, parsley and lemon. Preheat the oven to 425°F and coat a rimmed baking sheet with nonstick spray. 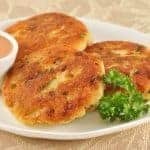 Season the fish fillets on both sides with salt and pepper, drizzle with 1 tablespoon of the lemon juice and a bit of olive oil. Set aside. Add 2 tablespoons of olive oil to a small saucepan and place over medium low heat. Stir in the garlic and as soon as the oil begins begins to bubble cook for 30 seconds, then turn the heat down to low and continue cooking. Give the garlic mixture a stir occasionally to be sure the garlic doesn’t brown. Cut the zucchini quarters in half crosswise and arrange on the prepared baking sheet. Season with salt and pepper and roast for 5 to 7 minutes. Add the tomatoes to the baking sheet, season with salt and pepper and return the pan to the oven for an additional 10 minutes. Add the fish to the sheet pan and continue roasting for an additional 8 to 12 minutes, or until the fish flakes easily with a fork. While the fish cooks, add the remaining tablespoon of lemon juice along with the capers and parsley to the garlic and olive oil mixture. Turn up the heat for a minute to warm the mixture then set aside. 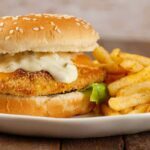 Top each fish fillet with a portion of the garlic-caper mixture before serving. To achieve a nice amount of caramelization on your zucchini, it’s best to get some of the excess moisture out before roasting. To do that you’ll want to arrange the zucchini quarters, cut side up on a flat surface and sprinkle with salt. Set aside for 10 minutes or until you see some liquid bead up on the cut surfaces. Blot with paper towels and proceed with the recipe. You can do the same with the plum tomatoes if desired. Important Note: Be sure to cut back on the salting during cooking to accommodate for this preliminary step. 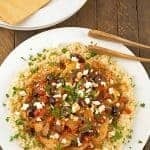 Mediterranean Chicken and Cauliflower "Rice"